On April 23, the U.S. will celebrate its fourth annual National Lost Dog Awareness Day (NLDAD). This canine-centric awareness day was created by Lost Dogs of America to bring attention to the multitude of dogs that that go missing from their homes each and every day, while providing resources and hope to reunite them. The day and efforts to reunite lost pets with their owners is a tribute to the human-animal bond. In the world of animal advocacy, adoption efforts of “homeless” dogs in shelters and rescues is a major and public focus. 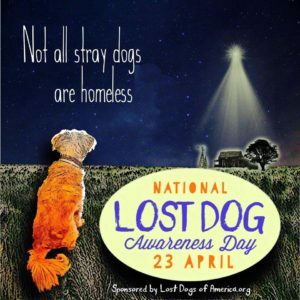 National Lost Dog Awareness Day places a new focus on lost pets and the need for increased “Return to Owner” (RTO) results since many “strays” are actually lost pets. This is at the heart of LDOA’s slogan “Not All Stray Dogs Are Homeless”. When a pet goes missing, owners enter a frantic and difficult process to locate him/her. 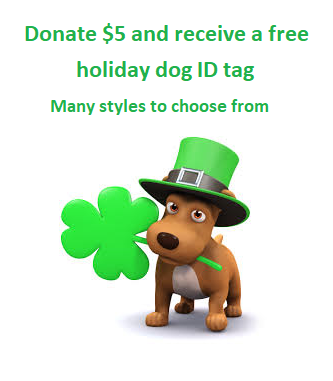 This is where Lost Dogs of America’s network of State specific volunteer efforts provide a free and valuable resource. Their years of expertise and dedicated volunteers provide a free support network for owners of lost pets. 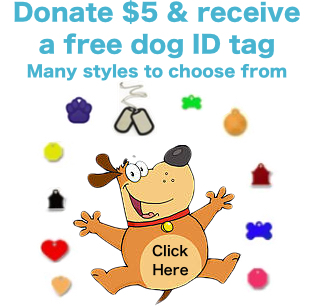 Increasingly, their efforts work in concert with a unique, free and integrated database of lost and found pets, HeLPingLostPets.com. This partnership provides a valuable complement to other lost and found pet sites and alerts offering unique exposure across State lines and searchable data vital for short AND long term missing pets. “When a dog goes missing, many families give up looking for their lost pet. National Lost Dog Awareness Day was created to give hope to the families still looking for their dogs and remind the public that not all stray dogs are homeless” explains Taney. “One of our most recent success stories was finding a Chihuahua named Mista. He was missing for almost 7 days.. We never gave up, and neither did Mista’s family. Together, and with the help of our social media following, we successfully reunited him with his family. Testimonial from Mista’s family”: I was contacted by someone who saw my lost dog post on LDI and recognized my dog in an animal shelter website! I was able to reunite with my fur baby in a couple hours after being notified of his whereabouts. BACKGROUND: NLDAD was created by Susan Taney, Kathy Pobloskie, and Marilyn Knapp Litt – directors of Lost Dogs Illinois and Lost Dogs of Wisconsin, Lost Dogs of Texas respectively. The Lost Dog’s mission of all-volunteer organization created for the exclusive purpose of providing a free service to help reunite families with their lost dogs has steadily grown in scope and impact. The Lost Dogs of America website was created and is maintained by the two original founding members of the Lost Dogs network: Lost Dogs of Wisconsin and Lost Dogs Illinois. The site shares articles, ideas and resources developed over years of dedicated expertise.. This entry was posted in Events, National Lost Dog Awareness Day, Our Organization and tagged National Lost Dog Awareness Day, Not all stray dogs are homeless on April 22, 2017 by Susan.